A Member of the Northern Guild of Toastmasters my experience and public speaking skills allied to a confident manner and warm, engaging personality make me the perfect toastmaster for your event. You only have one chance to make a good first impression at your event – and with me as your toastmaster you can rest assured that your guests will be smiling from the moment they arrive. 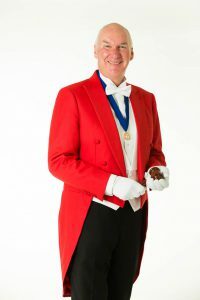 Whether you’re planning a wedding, an awards dinner, a charity event or an annual ball, the services of a reliable, professional and engaging toastmaster can make the difference between a great occasion and an unforgettable one. 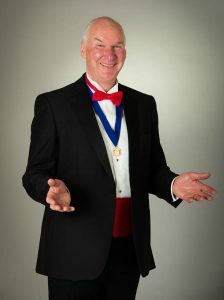 Professional toastmaster George Pye is your quintessential genial host. Highly experienced in public speaking and addressing audiences of all sizes, George brings a cheerful, reassuring, welcoming presence to every event. With George at the helm, you can relax, secure in the knowledge that all proceedings will be directed with the appropriate blend of fun and formality. George will work with you from the planning stages to ensure a smooth-running event. On the day, he’ll work diligently and unobtrusively to help your event run like clockwork, taking the stress out of delivering a well-organised, punctual and enjoyable occasion for all of your guests. Fully trained in the disciplines and protocols expected at every type of event, George offers two types of service. Giving a speech can be a daunting prospect for anyone. But with a little preparation it can be a very enjoyable experience. As a seasoned and confident public speaker, George offers individually tailored coaching sessions to help you develop or improve your performance. Whether you have to deliver a formal wedding speech, a business presentation, an awards ceremony address or an annual dinner talk, George will share his insider tips and hints on every aspect of public speaking. With his expert guidance, the whole experience will be more rewarding and successful for you – and your audience. George provides one-to-one tuition to individuals or groups of up to six people, in a location to suit you. Depending on your needs and experience, the sessions can last from a couple of hours up to a full day, with plenty of opportunity for you to hone your skills in a relaxed and informal atmosphere. If your event requires a less formal host, George can act as your master of ceremonies. Dressed in lounge suit or dinner jacket, rather than the traditional red jacket of the toastmaster, George will conduct your meeting or event with charm, professionalism and efficiency. It’s a service well suited to business events, corporate functions, annual meetings, seminars and conferences. George will work with you to ensure the event runs to schedule, making your guests feel welcomed and at ease. He will provide official announcements and introductions for your speakers and special guests. Crucially, his attentive services will ensure you can concentrate on the business of the day, without worrying about the smooth running of the event. You only have one chance to make a good first impression at your event – and with George as toastmaster you can rest assured that your guests will be smiling from the moment they arrive. As well as welcoming guests and making announcements and introductions, George will act as your essential on-the-day organiser and stress-reliever. He’ll coordinate all service providers, from caterers to photographers, with minimum fuss – so you can relax and enjoy every minute of your special occasion. Before the big day, George will discuss all your requirements with you, as well as advising on the appropriate formalities, etiquette and protocol for your style of event. As a consummate professional, George will put your mind at rest, alleviate any concerns and give you the peace of mind that everything will run smoothly on the day.